Remember when Russia invaded Georgia (the country) and Dubya went fishing rather than deal with it? Where was your outrage then? Lots of people were outraged. Just because you weren’t, doesn’t mean a damn thing. You guys realize these countries are mostly Russian populated right? Or do you support the current neo nazi movement in the Ukraine too? Because that’s your “uprising” you dumb shmucks. 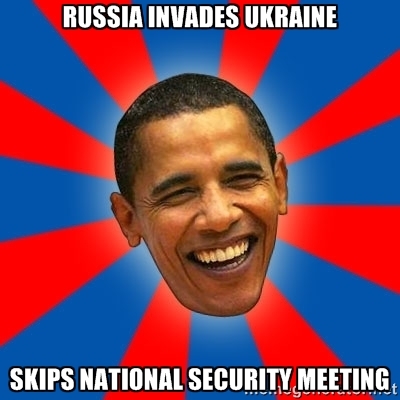 Now let’s be fair, President Obama almost NEVER attends the Security Briefings.